Since McDonald's Japan launched 2 kinds of breakfast menus on April 2, 2014, I've been interested in trying them. Big Breakfast comes with a hash brown, an English muffin, a sausage patty, scrambled egg and a jam. And Big Breakfast Deluxe comes with the items above, and also 3 pieces of hotcakes and butter and syrup. As I love McDonald's hotcakes, I went for Big Breakfast Deluxe today. I used a coupon for Big Breakfast Deluxe which came with a medium size drink. * You can choose Big Breakfast without drink or as a set. I was a little bit afraid that I could only order coffee as it's available from 5:00 AM ~ 10:30 AM, but they let me choose from soft drink section so that I ordered iced tea. It took a little bit longer than regular items to prepare, but I only waited for a couple minutes. Half of the tray was occupied by a paper box looked a gigantic bento box. In the box, there're an English muffin, scrambled egg, a sausage patty and 3 pancakes. Next to the box, there's a hash brown. In a plastic bag next to the hash brown, there're plastic cutlery, salt and pepper, and a packet of strawberry jam. This is what's included in the set. It's soft and fluffy, and I assume they actually cook this egg every order. Maybe? 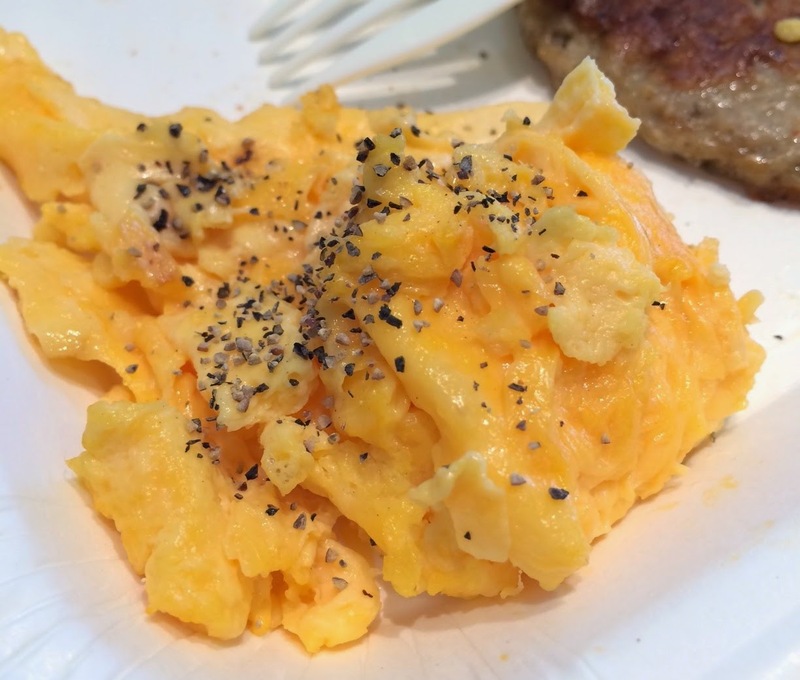 It's a plain scrambled egg, that's why there's a sachet of salt and pepper. I added pepper to add some tangy flavor. It's ok with pepper, but I wish they had ketchup also. When it became cold, it's flabby and chewy, so I should have eaten when it's hot. It's very salty and juicy, and it's about as large as English muffin. I didn't put anything to this sausage as it's seasoned already. When it's warm, I didn't sense any meaty flavor but juicy sausage patty, but once it's cold, it's got stinky odor and became greasy. Again, it's better when it's warm. English muffin was just a regular muffin heated in a special toaster. But to my surprise, it's got margarine inside already. The texture was same as Spanish Omelette Muffin; crispy outside and chewy and soft inside. I put some strawberry jam. The jam was as thick and firm as jello, but once it's put on a warm muffin, it's easy to spread. It's been over a decade since last time I had a hash brown from McDonald's. After such a long time without McD's hash brown, I enjoyed the crispiness outside and moist and chunky potatoes in side. Syrup was brown but it's made from starch syrup, sugar and caramel color, so it doesn't contain any maple syrup. However, this syrup is so addictive and tastes good with their hotcakes. Butter was whipped butter so it's so easy to apply on the hotcakes. Their hotcakes were thin but soft, and I tend to eat 3 slices of hotcakes all together. With 3 layers, I can enjoy the flavors from hotcakes and syrup with fluffy texture in my mouth. There's some strawberry jam left which I used for the English muffin, so I put some jam on the hotcakes. It added some sourness but it's too sugary. The hotcake syrup was more than plenty, so when I poured all the syrup, it became like a puddle in the plate. Until I saw the actual Big Breakfast Deluxe, I wasn't sure if I'd be able to eat it all, but each item had different flavor and texture, so I actually didn't get bored eating this set. However, when scrambled egg and the sausage patty got cold, they tasted worse and I ended up leaving about half of each item. The total calories is 934kcal, which is needless to say high. I heard in the states, you can order egg white only scrambled egg instead of whole egg, so I'm planning to order egg white scrambled egg in the states when I get a Big Breakfast. * Available during breakfast period only.